"Always know your objective and pursue it with ruthless abandon." There can be engaging, exciting low-budget science fiction that ends up not needing all of those expensive effects shots (Ascension, for one), but that's a rare animal indeed. Sadly Outerworld isn't one of them. Originally released in 1987 as Star Quest/Beyond The Rising Moon�and made for less than $115,000�it was one of those "labor of love" projects we hear about occasionally, where a young filmmaker (in this case writer/director Philip Cook) will struggle and scrimp to build miniatures and sets to sell his vision of a sci-fi future. The truth is that sometimes they work and sometimes they don't. 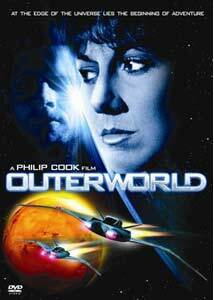 Cook has now retooled Star Quest/Beyond The Rising Moon, and the result is Outerworld. And what makes the whole process even more unfortunate is that this new version is what Cook refers to as a "hybrid", a reworking of the original, more tightly edited and with the addition of some upgraded effects shots. Yet the payoff still falls short of the mark, as the story seems hackneyed in spots, some of the acting is stiff and now the mixture of "old" visuals and "new" don't seem to blend that well together. In short, it's a cleaner, slightly more polished piece of dull sci-fi. It's set in 2074, and right out of the box there's a few of those "as you know..." conversational moments between characters where the history of future Earth is explained for the viewer. The evil corporation Kuriyama Enterprises has built a female spy/assassin named Pentan (Tracy Davis), supposedly built to be "unfettered by human emotion", who carries out the dirty work of stealing secrets, etc. Some sort of alien spacecraft has been discovered on a distant planet, and it promises to hold some amazing secrets for mankind, and the folks at Kuriyama want it for themselves. The problem is Pentan has been experiencing some human yearnings of her own, and instead decides to charter a spaceship and head to the alien craft by herself, which of course doesn't sit too well with her handlers. Hans Bachman does a variation of a rough-and-tumble Han Solo-y character, with not quite the same likeable swagger. Bachman's Harold is forced to carry on extended conversations with the droning Pentan, who I guess is supposed to sound detached, but instead just sounds bored. In between their chatter, there are black-helmeted henchmen, blinking video screens, spaceship chases and a frequent sense that Cook was somehow trying to make his own small scale version of Blade Runner. And yes, some of Cook's original visual effects (mostly miniatures) are ambitious and nicely done considering, and a few of the newer sequences gussy up things like outer space explosions, but for the viewer Outerworld is now just a dated artifact. Image has included the full-length version of Cook's original Star Quest/Beyond The Rising Moon as part of this DVD. So I suppose as a compare-and-contrast lesson there might be something of genuine interest here, aside from the overall inadequacies of the film itself�no matter which version you choose. Image Transfer Review: Outerworld has been issued by Image in its original 1.33:1 fullframe. The transfer shows the film's age and budget and constraints, and it is marred by nicks, debris, heavy grain, soft edge details and murky black levels. The newer visual effects do fare much better, looking brighter and better defined, but the poor print quality of the original material sort of negates all of that. Audio Transfer Review: Audio is presented in a plain 2.0 stereo offering, and the mix carries clear voice quality and some modest directional movement. Not a very expansive or splashy track overall, and a little harsh in spots, but certainly tolerable. Extras Review: I didn't really enjoy Outerworld, but Image has supplied a nice set of historical extras, including the full-length version of Cook's original Star Quest/Beyond The Rising Moon (01h:36m:52s). It not only runs a little longer than newer cut, but the pacing is not nearly as tight. The effects are understandably low-rent throughout, and comparing the visual improvements Cook made to his revisited version was actually kind of interesting. The Making Of Outerworld (13m:44s) has Cook discussing the "profoundly different viewing experience" of the new cut, as well looking back on the original production. Also featured are interviews and comments from most of the cast and crew, footage of the sets and miniatures and how the filmmakers did it all for around $114,000. There's a set of eight deleted scenes (08m:37s), a gag reel entitled Bloopers and Blunders of Outerworld (03m:24s), the theatrical trailer and three photo galleries (Concept Art, Behind-The-Scenes, Production). The disc is cut into 15 chapters, with no subtitle options. I'll give Philip Cook all the props in the world for not only trying to make a science fiction movie in the late 1980s on a shoestring budget, but also then for reworking and re-releasing it later with improved visual effects. Clearly a lot of work with a small crew and very little money. But I still can't find a way to like Outerworld�or even its original incarnation as Star Quest/Beyond The Rising Moon�or see it as anything but just plain dated sci-fi that wants to look like something more than it is, but can't.